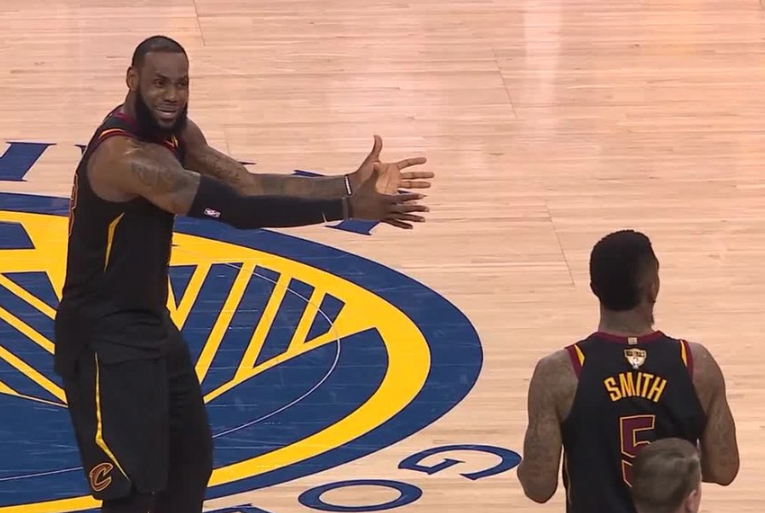 After a blunder that cost the Cleveland Cavaliers the win in the first NBA Finals match against Golden State Warriors, J.R. Smith sensationally looked to pass the blame to star man LeBron James. With seconds remaining on the clock in the fourth quarter and the game tied at 107-107, Smith rose to win the rebound after a missed free-throw from George Hill. But instead of looking to settle the game under pressure from Warriors’ Kevin Durant, Smith ran in the opposite direction much to the dismay of his team-mates, with observers suggesting he told LeBron he assumed Cleveland were ahead. ‘I knew we were tied I just thought we were going to call a time-out because I got the rebound,’ Smith told reporters post match. ‘I’m pretty sure nobody thought I was going to shoot over KD (Kevin Durant) right there. The exchange between LeBron and Smith instantaneously went viral with the reaction of the former gripping the basketball world. And when quizzed on why he opted not to shoot in the final moments, Smith insisted he had no desire to become Durant’s fifth block of the evening and instead wanted a time-out called. In the NBA, any player or coach can call a time-out if the team has possession and so with one remaining, confusion surrounded the final stages for the Cavaliers.